Our range of products include emotron m20 shaft power monitor. 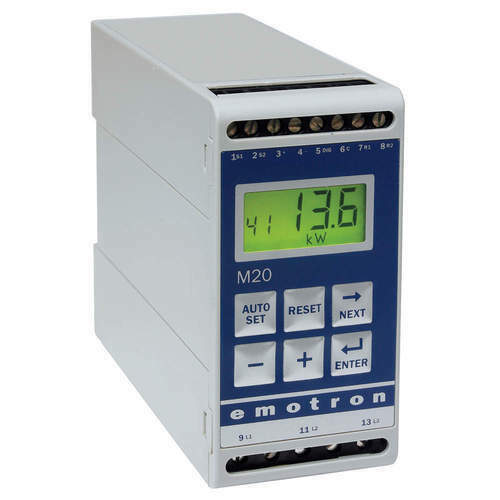 Emotron M20 shaft power monitor helps you save time and money. It protects your pumps and other equipment against damage & detects process inefficiency.Early warnings allow you to take preventive action.Unique features include measuring shaft power output & using the motor as a sensor.The result is reduced maintenance & installation costs,extended equipment lifetime & increased reliability. Detects over & under load.Sends warning or stops the pump. Uses pump motor as sensor,eliminates need for external sensors.No moving parts increases reliability. Shuts pump off before it runs dry. Looking for “Shaft Power Monitor”?